It’s a small world, all right! While chatting with Mary Anne, I found out she was born a stone’s throw from Glastonbury, the fabled Isle of Avalon, and one of my favourite parts of England. My husband’s Aunt Maisie still lives there, and when we visit her, we take a hike up Glastonbury Tor, which is quite a workout. Mary Anne is also a huge Ricardian, as I am, and she’s descended from the Stanley brothers, who betrayed Richard III at the Battle of Bosworth, which directly resulted in his losing the battle, his crown, and his life. Mary Anne is also the award-winning author of the International Best Selling Series — The Du Lac Chronicles. Set a generation after the fall of King Arthur, The Du Lac Chronicles takes you on a journey through Dark Age Briton and Brittany, where you will meet new friends and terrifying foes. Based on legends and historical fact, The Du Lac Chronicles is a series not to be missed. Born in Bath, Mary Anne grew up in the southwest of England, surrounded and influenced by centuries of history and mythology. Glastonbury was a mere fifteen-minute drive from her home, and tales of King Arthur and his knights were part of her childhood. Hi, everyone. Waves!Thank you so much, Diana, for inviting me on to your fabulous blog. For those who don’t know me, my name is Mary Anne Yarde. I was born in Bath, and I grew up in the south-west of England. I lived a mere 15 minutes from Glastonbury — the fabled Isle of Avalon. Tales of King Arthur and his Knights were a part of my childhood. I am an award-winning author of the International Best Selling series — The Du Lac Chronicles. This series is set a generation after the fall of King Arthur. 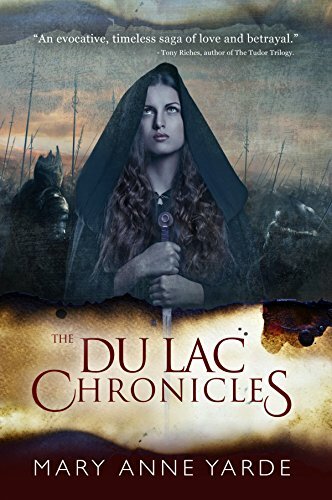 The Du Lac Chronicles takes you on a journey through Dark Age Britain and Brittany, where you will meet new friends and terrifying foes. Climbing Glastonbury Tor and watching the sunset would be a great way to spend 2 hours! I am a real bookworm. I love reading, and I get through a lot of books in a year. My favourite genre is historical fiction, but I also like fantasy, thrillers, and romance books. What type of music do you enjoy relaxing to? According to my children, my music taste is appalling, so I must be doing something right! I am a life long fan of Bon Jovi and Bryan Adams, but I have just discovered For King and Country — much to my teen’s disgust! I personally can’t see the problem with For King and Country, and as I am subjected daily to Cryoshell, Nickelback and Avenged Sevenfold, I think it is fitting to have my revenge and play music that I like occasionally! Oh my gosh, I just realised how old I sound! If I am really stressed, then my Zumba video workout will be taken out of storage! If I am only a little stressed, then I would pick up a book — any excuse! I don’t have a comfort food. But I do drink a lot of Red Rooibos (Redbush) tea, so I think thatwould probably be my comfort food… comfort beverage! When did you write your first book? How long did it take you to write it? I started writing 15 years ago, but I never took it seriously until about two years ago. Book 1 of The Du Lac Chronicles was about 12 years in the making. Thankfully Book 2 only took six months! Where and when do you write? Tell us about your favorite work place and time. Any special reason? I dedicate three hours, Monday to Friday, every afternoon to writing. I turn off my phone — and depending on what I am going to write about — I choose some appropriate music to listen to. I tend to listen to music by the composer James Horner, as it is very atmospheric and helps me visualise the scenes I want to write. I don’t have a desk. I find it really uncomfortable to sit up at a table to write. The posture police would be furious with me because I write sitting up on my bed. Grimace! How do you write? Do your characters come to you first or the plot or the world of the story? How do you go on from there? Maybe you can give us an example with one of your books. The characters come first, and they drive the story forward. I write Arthurian fiction set in the Dark Ages. So it is a case of research, research, research, before I even think about writing. I don’t plan or write down the plot. I know where my characters are going to end up, I just need to get them there. Where do you get your ideas? Do you jot them down in a notebook, in case you forgot? As I said the characters come first. I then research the era my books are set in. I am one of those terrible researchers who pens in the margins of factual books and underline sentences. I also make notes, on random bits of paper, but mostly I just jot down book and page references. Have you ever wanted to write your book in one direction but your characters are moving it in another direction? What did you do in such a situation? Oh my gosh, yes! One of my characters, Merton du Lac, loves to throw me curve balls all the time. I have absolutely no control over him at all, and if I try to fight him for creative control, it just goes terribly wrong, and in the end, he wins. Perhaps I should credit Merton as being the author! You’re having a party. What character from any of your books do you hope attends? Why? What character do you hope doesn’t attend? Why? I would definitely invite Merton —a party wouldn’t be the same without him. Alden, his brother, would get an invitation too, along with his wife, because they are both great company. I would be a little hesitant about inviting Budic du Lac, he is not particularly the party type person, and he is very moody. He would probably have us all arrested and thrown in the dungeons.